Edgar Allan Poe is one of my favorite writers. Many know him for his short stories and a poem or 2 (“Quoth the raven”). But the few examples of his work that we all know from high school don’t even begin to uncover his genius – or madness. Read “Hop-Frog” or “The Oblong Box”. The man was the best at what he did. The same can be said of his poems. Yes, we all know “The Raven”, but go read “A Dream Within a Dream”, then watch Inception, and try to convince yourself that the two aren’t related. Anyway, in October of 2012, just in time for Halloween, I decided to create a show using his poetry. Not a poetry recitation (except in one case – which I billed as a “staged reading”), but full dramatic interpretations. 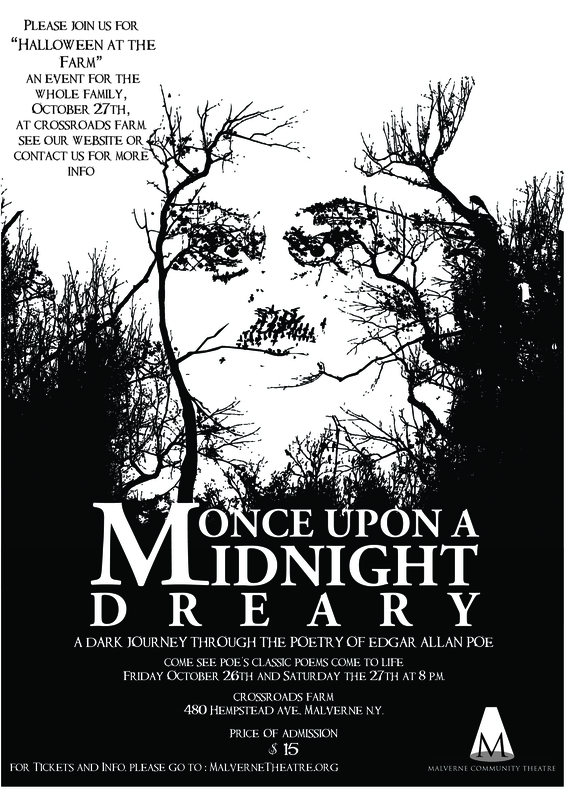 Poe’s poetry is autobiographical, very descriptive, and very musical. My task was to tap into this work and bring the characters and situations to life. First, one of the main things that made this show unique was its location: a farm. I decided that in order to up the creep factor (and help out a local business) that I would stage the show in a tent in the middle of the farm field. It was dark, and the only lights were from my stage lights and people had to use outhouses (including the cast and crew). Exactly what I was going for. For a few years leading up to the show, It had been a goal of mine to figure out a way to take Poe’s work and bring it to the stage. Should I go with his short stories? How would I dramatize them, should I go with someone else’s dramatization? I decided against both methods because the stories would be tough to dramatize, tough to recreate on stage, and the problem with someone else’s interpretation is that the language – Poe’s language – will most likely not be accurate. The language, to me, is one of the most important things (if not the most important thing). I chose my poems, tried to stick them in some sort of logical order, and then worked on creating the show from scratch. When I first had the idea to do this show, this poem was the first one that popped into my mind. The darkness of its theme would fit well into the setting I chose, and it’s a beautifully written story, with so much power packed into so few words. If we take a look at this poem and break it down, we can see that its structure is very much like that of any good story – there’s an arc, that is, a beginning, middle, and end. That’s the first thing that stuck out, and the reason that I knew it could be turned into a scene without stretching too much. Next, because it’s a poem by an exceptional poet, there is a lot of meaning packed into those stanzas. I knew that this could lend itself to creating a terrific character (the character of the Narrator, who tells this story to the audience) with real emotion and depth. Third, there is a lot of imagery (again, credit to the writer), so while I certainly relied on the audience to do a little work during this production (imagination! ), I was still able to create some visual images on my own to accompany the acting and the storytelling. Stanza 1 is the set up. The narrator is speaking directly to the audience. He introduces the story and the character of Annabel Lee. We know from this stanza that they have, or had, a relationship. We don’t know the extent yet, but he has captured out attention. For setting, I used a dark background and blue lighting, to simulate the night and reflection of the water. At that point, her light is shut off (I’m talking about the stage lights, not the light of her soul or anything like that) and she retreats backwards, exiting the stage area, towards the afterlife (or, at the very least, out of view of the audience). In stanza 6, the memory is over and he is back in the real world. 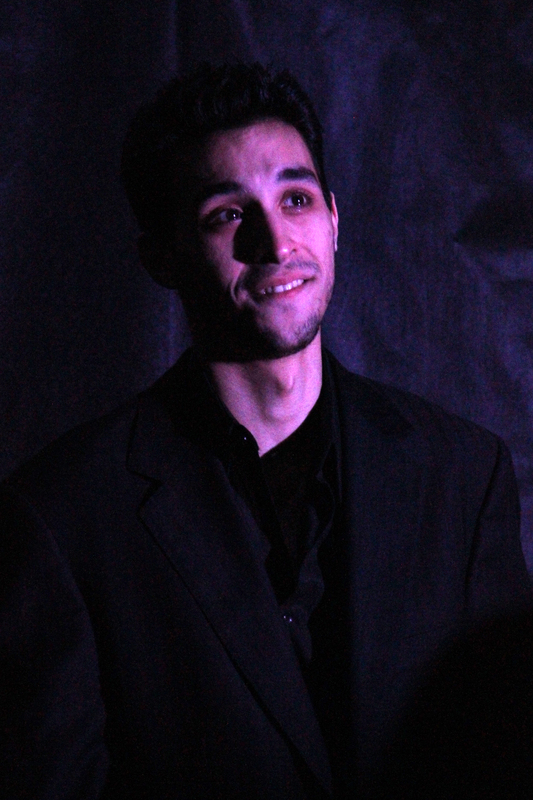 The actor who played the narrator (above) did a phenomenal job of taking a poem and creating a three-dimensional person from it, and the audience was very appreciative of the effort (I think they were expecting a simple poetry reading). At this point, a rigging is pulled, and a tombstone appears next to the actor with a spot on it. Blackout. I followed this scene with “The Raven”. It seemed like a logical flow of ideas – in “Annabel Lee”, the man remembers his lover, speaks of losing his lover, and then in “The Raven”, the man is in his chamber, slowly going crazy wondering if his lost love is being taken care of in the afterlife. I tried to choose poems that could be loosely linked thematically, and present the possibility of the entire show being centered around the same person (the men in both “Annabel Lee” and “The Raven” could be the same person if you really want them to be). Of course, there is some truth to this, as this mysterious person is Poe himself. A little creativity can really go a long way when you’re trying to do original work. Always aim to take your audience on a journey, and be open to finding inspiration everywhere.